The Armatix smart gun is implanted with an electronic chip that allows it to be fired only if the shooter is wearing a watch that communicates with it through a radio signal. It is not sold in the U.S.
William Marshall of the New Jersey Institute of Technology with two specially modified guns used for research on grip sensor technology. A gun that fires only in the hands of its owner isn't science fiction anymore. A so-called smart gun is already on sale in Europe. But you won't find it on store shelves in this country — in part because of an obscure New Jersey law that's had unintended consequences for the rest of the nation. Basically, the Childproof Handgun Law of 2002 says that once "personalized handguns are available" anywhere in the country, all handguns sold in New Jersey must be smart guns within 30 months. The goal of the law was to spur "research, development and manufacture" of smart guns, according to its sponsor, New Jersey state Sen. Loretta Weinberg. But in practice, supporters and critics of the law now agree, that has not been the case. "It actually doesn't matter if the gun has been sold," says David Kopel, a policy analyst at the Cato Institute. "If there's just one available for sale anywhere in the United States, then that triggers the handgun ban. So who would want to sell a smart gun knowing that, by doing so, they'd be imposing a handgun ban on New Jersey?" A few gun retailers have tried. Recently, one shop in California and another in Maryland announced they would stock the Armatix iP1, a German-made gun that only fires if the owner is wearing a special watch. In an unusually personal video message that he posted on Facebook in May, Andy Raymond, the co-owner of Engage Armament in Maryland, explained why he wanted to sell the gun. "I thought that if you got people who never wanted [a gun] or didn't want one in their house because of their kids ... getting at it," Raymond said, "that if they bought a gun, that that's a good thing." The response was quick and intense. Both Engage Armament and the California store were flooded with angry calls and messages from people who consider the New Jersey law an infringement of the Second Amendment's right to bear arms. Raymond says he received multiple death threats. Both stores quickly backed down on their plans to sell the Armatix gun. "I don't think the reaction was at all surprising, because it's viewed as being a gun control push," says Lawrence Keane, vice president of the National Shooting Sports Foundation, the firearms industry's trade group. Keane says his organization opposes New Jersey's mandate to sell only smart guns, but he says the foundation is not opposed to the technology itself. "If people think there's a market for these products, then the market should work," Keane says. "People should be allowed to build what they think is a better mousetrap. The firearms industry has never been opposed to the research and development of this technology." In Newark, a lab at the New Jersey Institute of Technology is trying to build a gun that will read the grip of its owner. "I know, had it been readily available for me back in the day, I would've been using it," says William Marshall, a former police officer and brigadier general in the National Guard. Today, Marshall, now an assistant vice president at NJIT, is holding a normal handgun that's been specially fitted with dozens of tiny sensors in the grip. NJIT officials hope this research will eventually lead to a gun that fires only for authorized users, and not for their children. But researchers concede this is not as simple as adding a few electronic sensors to the grip of an existing gun, because guns present unique engineering challenges. "The pressure shock, the buildup of heat — all these things can be difficult, but not insurmountable," says Donald Sebastian, senior vice president for research and development at NJIT. If all goes well, Sebastian thinks NJIT can solve those engineering problems within two years. The political obstacles may be harder to overcome. Even the main sponsor of New Jersey's smart gun law is now having second thoughts. Loretta Weinberg concedes that the law's mandate has become an impediment to the development of smart guns. "That's the exact opposite of what we really intended to do," Weinberg says. "If I'm willing to say, well, maybe we made a mistake here; we need to remove this — then I would expect that those who think we made a mistake will join in to say, hey, you're right, and now let's see the marketplace move ahead." Weinberg is offering to repeal New Jersey's smart gun mandate if the National Rifle Association will publicly agree not to stand in the way of the technology. Weinberg says she's gotten no reply from the NRA. The group didn't respond to NPR's request for comment, either. Keane of the National Shooting Sports Foundation says he's still worried that all of the smart gun technologies under development depend on batteries and other electronics that can fail. "People use firearms for self-defense, and it's very, very important they operate when it's a time of need, and a highly stressful situation," Keane says. 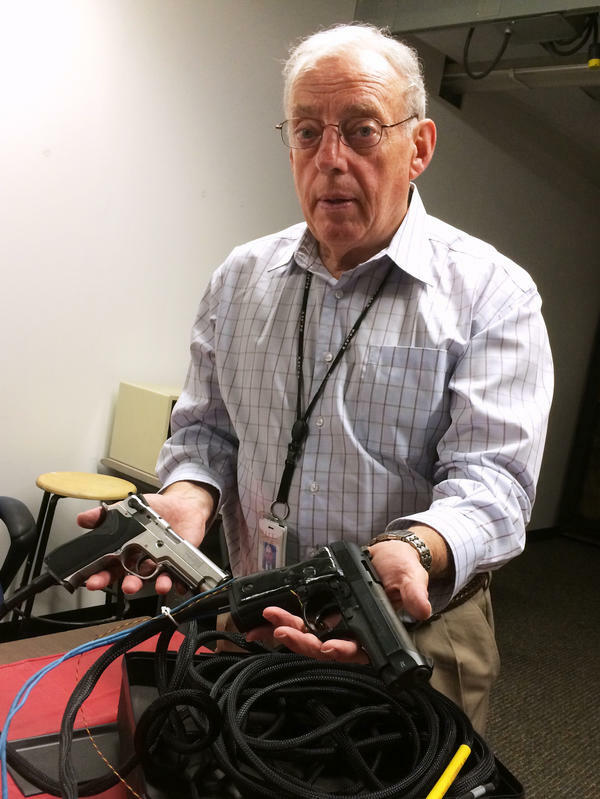 Reliability concerns will go away once smart guns are on the market, says NJIT's Sebastian. "If we get law enforcement and military and other respected professionals to have experience with it, to show that it doesn't break and that it performs when it's supposed to, that's the way you start to break the logjam," Sebastian says. But so far, no law enforcement agency has signed on to use smart guns. And there are plenty of consumers far beyond New Jersey who equate smart guns with gun control. It's ALL THINGS CONSIDERED from NPR News. I'm Audie Cornish. We start this story with the story of how a law in New Jersey helped block the sales of smart guns in this country. That certainly wasn't the intention of the 12-year-old law. 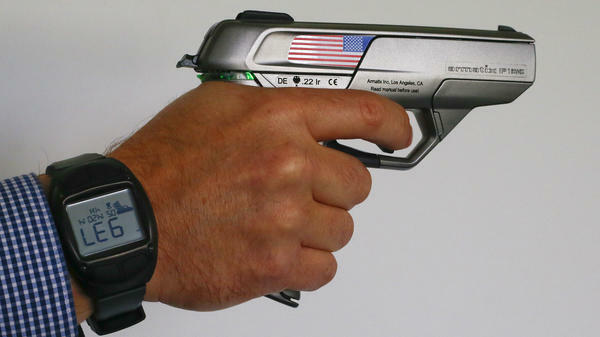 The smart gun only fires when being held by its owner, and you can already buy one overseas. NPR's Joel Rose explains what happened here. JOEL ROSE, BYLINE: There is a lab at the New Jersey Institute of Technology in Newark that's trying to build a gun that will read the grip of its owner. BILL MARSHALL: This is a normal 9 mm Beretta pistol. These grips have little piezoelectric sensors in it. ROSE: Bill Marshall is a former cop and brigadier general in the National Guard. He's now an assistant vice president at NJIT. The gun he's holding has been fitted with dozens of tiny sensors. Marshall hands the gun to me for a training simulation that's supposed to gather data about how I squeeze the trigger in a stressful situation. MARSHALL: Boom, and it's over just that quick. ROSE: Eventually, Marshall hopes this information will lead to a gun that only fires for authorized users and not for their children. MARSHALL: I know, had it been readily available for me back in the day, I would've been using it. ROSE: But this is not as simple as adding a few electronic sensors to the grip of an existing gun. Donald Sebastian is vice president for research and development at NJIT. He says guns prevent unique engineering challenges. DONALD SEBASTIAN: The pressure shock, the buildup of heat - all these things can be difficult, but not insurmountable. ROSE: If all goes well, Sebastian thinks NJIT can solve the engineering problems within two years. But the political obstacles may be even harder to overcome. Just ask the German gun maker Armatix. ROSE: That's a video of the Armatix iP1 firing. It's a handgun that will only work if the owner is wearing a special watch. It's already on sale in Europe. But you can't buy one in the US. To understand why, you have to know about an obscure law that's been on the books in New Jersey since 2002. It was supposed to encourage the development of smart guns, but that is not what happened in practice. Basically the law says that once a smart gun is available anywhere in the country, all handguns sold in New Jersey must be smart guns within 30 months. DAVID KOPEL: It actually doesn't matter if the gun has been sold. ROSE: David Kopel is a policy analyst at the Cato Institute. He says New Jersey's law has had unintended consequences for the rest of the country. KOPEL: The New Jersey law says if there's just one available for sale anywhere in the United States, then that triggers the handgun ban. So who would want to sell a smart gun knowing that by doing so, they'd be imposing a handgun ban on New Jersey? ROSE: Well, a few gun retailers did try. One shop in California and another in Maryland each announced they would stock the Armatix iP1 earlier this year. ANDY RAYMOND: I'm Andy from Engage Armament. I'm the co-owner here. ROSE: Andy Raymond of Engage Armament in Maryland explained why he wanted to sell the gun in an unusually personally video message that he posted on Facebook in May. RAYMOND: I thought that if you got people who never wanted one or didn't want one in their house because their kids or something like that - kids getting at it, that if they bought a gun, that that's a good thing. ROSE: The response was quick and intense. Raymond says he got a flood of angry messages from people who consider the New Jersey law an infringement of their Second Amendment rights. He says one of them even threatened to burn down his store. So Raymond stayed there all night. That's when he made the video. RAYMOND: So anyway, obviously, I received numerous death threats today. I [bleep] really appreciate that. That's [bleep] classy. That's a great thing for gun rights, when you threaten to shoot somebody. ROSE: But Raymond did change his mind about selling the Armatix smart gun. And he explicitly said he did not want to trigger New Jersey's law. LAWRENCE KEANE: I don't think that the reaction was at all surprising because it's viewed as being a gun-control push. ROSE: Lawrence Keane is with the National Shooting Sports Foundation, the firearms industry's trade group. Keane says his organization does not oppose the development of smart guns. KEANE: If people think that there's a market for these products, then the market should work, and people should be allowed to build what they think is a better mousetrap. The firearms industry has never been opposed to the research and development of this technology. We have always been opposed to mandates. ROSE: Now even one of the New Jersey law's main sponsors is having second thoughts. State Senator Loretta Weinberg concedes that the law's mandate has become an impediment to the development of smart guns. SENATOR LORETTA WEINBERG: That's the exact opposite of what we really intended to do. Now, if I'm willing to say, well, maybe we made a mistake here, we need to remove this, then I would expect that those who think we made a mistake will join in to say, hey, you're right. And now let's see the marketplace move ahead. ROSE: Weinberg is offering to repeal New Jersey's smart gun mandate if the National Rifle Association will publicly agree not to stand in the way of the technology. Weinberg says she's gotten no reply from the NRA. The group did not respond to our request for comment either. But Lawrence Keane of the National Shooting Sports Foundation says he's still worried that the technology depends on batteries and other electronics that can fail. KEANE: People use firearms for self-defense, and it's very, very important that they operate when it's a time of need in a highly stressful situation. ROSE: But Donald Sebastian at the New Jersey Institute of Technology says reliability concerns will go away once smart guns are on the market. SEBASTIAN: If we get law enforcement and military and other respected professionals to have experience with it, to show that it doesn't break and that it performs when it's supposed to, that's the way you start to break the logjam. ROSE: But so far, no law enforcement agency has signed on to use smart guns. And there are plenty of consumers far beyond New Jersey who equate smart guns with gun control. Joel Rose, NPR News. Transcript provided by NPR, Copyright NPR.